Open Europe: SPD and eurobonds: will they, won't they? Sigmar Gabriel, the Chairman of the main German opposition party, the SPD, today told Berliner Zeitung that his party was prepared to change its eurozone policy by accepting collective debt liability in exchange for stricter budgetary oversight, claiming that the Merkel government’s current strategy had failed. Gabriel acknowledged that for such a move to be possible, the German constitution would need to be altered and put to the public in a referendum. So far SPD has broadly supported Merkel’s dual strategy of bailouts and savings/reform packages, albeit with additional emphasis on some mild stiumulus measures. And despite scathing rhetoric about the government’s political management of the crisis, when it came to it, SPD MPs have consistently voted with the government in the Bundestag. The interview follows lengthy essay in Saturday’s FAZ by the philosophers Jürgen Habermas and Julian Nida-Rümelin, and economist Peter Bofinger, in which they argued that an EU political union with a core currency area was necessary to “win back at European level the sovereignty stolen by financial markets”. They argued that this would entail mutual fiscal, economic and welfare policies, the alternative to which would be a market-conformist facade democracy”. 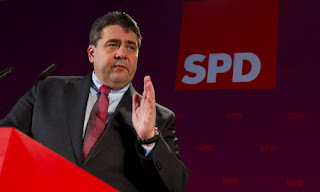 The essay has been widely linked to Gabriel’s comments in the German media today, not least because Gabriel has invited Habermas to help draft the SPD’s manifesto ahead of next years’ federal elections. Should we get excited? Not yet. While the comments are significant, Gabriel did not explicitly say what form this debt pooling would take. In fact, Berliner Zeitung merely paraphrases Gabriel so it's not entirely clear exactly what he said. Along with the Greens, the party had previously indicated that it could accept a debt redemption fund – a time limited pooling of a certain portion of eurozone states’ debts – while appearing to rule out ‘full’ debt pooling / eurobonds. In addition, also Gabriel seems to support the classical German quid pro quo for debt-pooling - strict German-style budget oversight across the eurozone. As we've argued repeatedly, such oversight is very difficult to achieve. In addition, SPD lacks a single leader - Gabriel is only one part of a 'leadership troika' - so it is far from clear whether this is/will become official party policy. Former Finance Minister Peer Steinbrück's rhetoric on the crisis has for example been tougher than Gabriel's. Another side of this story is that Merkel seems not able to keep the pro-Europe group together. Getting things approved especially when qualified majorities are necessary becomes more and more difficult. Btw this is only part of the story. The other part is that they accuse Merkel of trying to do a rescue via the backdoor (ECB) and that she is showing no political backbone as well in that respect). -CSU is digging itself in, which makes making u-turns much more difficult. -FDP looks to get tougher as well (allthough everybody will expect them to make a u-turn at the end (easy without a spine and short of memory). -SPD/Greens angry about the way information is presented (and imho rightly so) and moving into Eurobonds and want voters more involved. Anyway 2 (rescue-) captains on a ship is usually a recipe for disaster. One left, one right, end up against the iceberg. Anyway as he states the German voter will have to decide on that (which makes it a no go). He is not known as the brightest guy in the classroom, but I always wonder do these traditional left party guys really think people mainly vote for them because the want solidarity with all the poor etc in the world? Most simply appear to be pro solidarity as they benefit from it and preferably in times of cuts want to see it reduced to the own group. Nearly all populist parties are based upon this and where they have established themselves are considerably more successful than the traditional left. Those darn tyrannical financial markets - always expecting people to meet the obligations of their consensually agreed-upon contracts. Who do they think they are? There will be no effective Eurobonds. If the EU were a democracy, and if a majority voted to share the debt burden, and if there was a central federal bank they all voted for, then it would be possible. Three big ifs, an insuperable obstacle. The USA managed only after the most bloody civil war ever: and they were the same nationals. There are already eurozone bonds, those issued by the EFSF, and the German political elite have gone along with that. So the answer is that whatever German taxpayers may think the chances are that their political masters will eventually agree to do whatever is seen to be necessary to preserve the present eurozone intact and then allow it expand. And because the German political elite would present a united front against the German people there would probably be nothing that the latter could do to stop that happening. There's a small chance that the Constitutional Court would stop it, but the people would not be allowed to stop it by casting votes in elections.